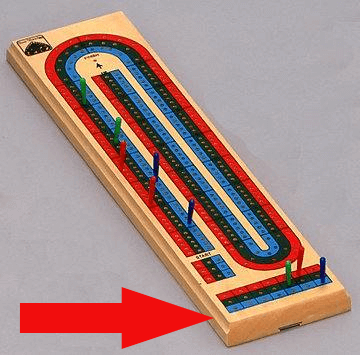 What are the 21 Holes at the Bottom of a Cribbage Board For? - Casino Answers! Casino Answers » Cribbage » What are the 21 Holes at the Bottom of a Cribbage Board For? What are the 21 holes at the bottom of the cribbage board for? You will find those holes on any standard Cribbage board. You are less likely to find them on the specialty cribbage boards(like the cribbage board shaped like a “29”). Those holes are used to keep track of the amount of games a player has won. Traditionally when playing Cribbage you don’t play just 1 game – you play an “up to” series, with “up to 7 wins” series of Cribbage being the popular choice. You use the bottom holes to keep track of the games won by each player. This is also very handy if you play over a period of time, rather than in one sitting. This is why each Cribbage board comes with 3 pegs of the same colour. 1 of the pegs is to be used to keep track of games won. As you can see in the above board – it is colour coded, so it is extremely easy to keep track of who has won however many games. In some cribbage boards there will be no color coding. In situations like this, that is why you have the extra colour peg – you use that to denote which player has won those games.